Zaman International developed the Plots for Tots Infant Burial Program to assist indigent families who cannot afford proper burials for their fetus, infant or toddler. 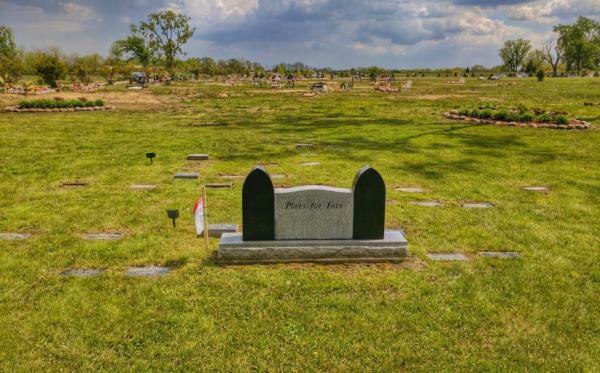 In 2009, Zaman purchased 230 burial plots for the Plots for Tots Cemetery, located in Westland, MI., to provide a final resting place for these infants. Plots for Tots was created in response to the influx of refugees that sought salvation in Michigan after their countries were torn by war. Refugees frequently arrived having suffered severe trauma, and the effects of warfare began to manifest itself in the health of these women and children. Due to these traumas, women from this community often suffered from miscarriages or from the death of their newborns shortly after birth. Many of these families were already facing financial hardships, and with the high costs of burial, the families were unable to afford a proper burial for their child especially one that was in accordance with their religious beliefs and practices. For others, the parents lacked a firm grasp of the English language and could not fill the forms to release the infant remains. Babies were cremated against their family’s cultural or spiritual practices. On another occasion, 22 infants and fetuses were found stored in jars and tubes in a hospital laboratory. These heartbreaking incidents prompted the need for an infant burial cemetery. Zaman knew there needed to be a “voice for the voiceless,” so we ensured that Plots for Tots became a registered program under the State of Michigan. Through the program, Zaman assisted hospitals to develop policies that protect the fetuses and infants and their families during hospital discharge procedures and to provide resources to properly put these babies to rest. Since 2005, Plots for Tots has supported 54 grieving families by giving their child a dignified burial ceremony. This program is open to all indigent populations regardless of ethnicity or religious affiliation. For parents facing the devastating loss of a child, it’s even more heartbreaking to be unable to provide a proper burial for their loved ones. To support these families and the Plots for Tots program, please Donate Now. For more information on the Plots for Tots program, contact us at info@zamaninternational.org or (313) 551-3994.